Eric Ken Shinseki (/ʃɪnˈsɛki/; born November 28, 1942) is a retired United States Army general who served as the seventh United States Secretary of Veterans Affairs (2009–2014). His final United States Army post was as the 34th Chief of Staff of the Army (1999–2003). Shinseki is a veteran of two tours of combat in the Vietnam War, in which he was awarded three Bronze Star Medals for valor and two Purple Hearts. He was the first Asian-American four-star general, and the first Asian-American Secretary of Veterans Affairs. Shinseki was born in Lihue, Kauaʻi, in the then Territory of Hawaii, to an American family of Japanese ancestry. His grandparents emigrated from Hiroshima to Hawaii in 1901. He grew up in a sugarcane plantation community on Kaua'i and graduated from Kaua'i High and Intermediate School in 1960. While attending Kaua'i he was active in the Boy Scouts and served as class president. As a boy, Shinseki learned that three of his uncles had served in the 442nd Infantry Regiment, a unit of Japanese Americans that became one of the most decorated fighting units in United States history. Motivated by his uncles' example, he attended the United States Military Academy and graduated in 1965 with a Bachelor of Science degree and a commission as a second lieutenant. He earned a Master of Arts degree in English Literature from Duke University. He was also educated at the Armor Officer Advanced Course, the United States Army Command and General Staff College, and the National War College of National Defense University. Shinseki served in a variety of command and staff assignments in the Continental United States and overseas, including two combat tours with the 9th and 25th Infantry Divisions in the Republic of Vietnam as an artillery forward observer and as commander of Troop A, 3rd Squadron, 5th Cavalry Regiment during the Vietnam War. During one of those tours while serving as a forward artillery observer, he stepped on a land mine, which blew the front off one of his feet; after spending almost a year recovering from his injuries, he returned to active duty in 1971. Shinseki has served at Schofield Barracks, Hawai'i with Headquarters, United States Army Hawaii, and Fort Shafter with Headquarters, United States Army Pacific. He has taught at the U.S. Military Academy's Department of English. During duty with the 3rd Armored Cavalry Regiment at Fort Bliss, Texas, he served as the regimental adjutant and as the executive officer of its 1st Squadron. Shinseki's ten-plus years of service in Europe included assignments as Commander, 3rd Squadron, 7th Cavalry, 3rd Infantry Division (Schweinfurt); Commander, 2nd Brigade, 3rd Infantry Division (Kitzingen); Assistant Chief of Staff, G3, 3rd Infantry Division (Operations, Plans and Training) (Würzburg); and Assistant Division Commander for Maneuver, 3rd Infantry Division (Schweinfurt). The 3rd Division was organized at that time as a heavy mechanized division. He also served as Assistant Chief of Staff, G3 (Operations, Plans, and Training), VII Corps (Stuttgart). 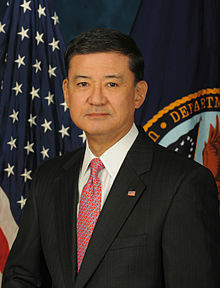 Shinseki served as Deputy Chief of Staff for Support, Allied Land Forces Southern Europe (Verona), an element of the Allied Forces Southern Europe. From March 1994 to July 1995, Shinseki commanded the 1st Cavalry Division at Fort Hood, Texas. In July 1996, he was promoted to lieutenant general and became Deputy Chief of Staff for Operations and Plans, United States Army. In June 1997, Shinseki was appointed to the rank of general before assuming duties as Commanding General, Seventh United States Army; Commander, Allied Land Forces Central Europe; and Commander, NATO Stabilization Force in Bosnia and Herzegovina. Shinseki became the Army's 28th Vice Chief of Staff on November 24, 1998, then became its 34th Chief of Staff on June 22, 1999. Shinseki retired on June 11, 2003 at the end of his four-year term. His Farewell Memo contained some of his ideas regarding the future of the military. At that time, General Shinseki retired from the Army after 38 years of military service. As of 2009[update], Shinseki was the highest-ranked Asian American in the history of the United States. Additionally, as of 2004, he is the highest-ranked Japanese American to have served in the United States Armed Forces. 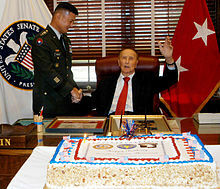 Shinseki as Army Chief of Staff thanks Senator Strom Thurmond for his service to the country during his 100th birthday celebration. Shinseki joined Thomas White in naming the centerpiece of the National Museum of the Army in Thurmond's honor in a ceremony at his office on Capitol Hill December 4, 2002. During his tenure as Army Chief of Staff, Shinseki initiated an innovative but controversial plan to make the army more strategically deployable and mobile in urban terrain by creating Stryker Interim-Force Brigade Combat Teams. He conceived a long term strategic plan for the army dubbed "Objective Force", which included a program he designed, Future Combat Systems. One other controversial plan that Shinseki implemented was the wearing of the black beret for all army personnel. Prior to Shinseki implementing this policy, only the United States Army Rangers could wear the black beret. When the black beret was given to all soldiers and officers, the Rangers moved to the tan beret. Shinseki publicly clashed with Secretary of Defense Donald Rumsfeld during the planning of the war in Iraq over how many troops the United States would need to keep in Iraq for the postwar occupation of that country. As Army Chief of Staff, Shinseki testified to the United States Senate Committee on Armed Services on February 25, 2003 that "something in the order of several hundred thousand soldiers" would probably be required for postwar Iraq. This was an estimate far higher than the figure being proposed by Secretary Rumsfeld in his invasion plan, and it was rejected in strong language by both Rumsfeld and his Deputy Secretary of Defense, Paul Wolfowitz, who was another chief planner of the invasion and occupation. From then on, Shinseki's influence on the Joint Chiefs of Staff reportedly waned. Critics of the Bush Administration alleged that Shinseki was forced into early retirement as Army Chief of Staff because of his comments on troop levels; however, his retirement was announced nearly a year before those comments. When the insurgency took hold in postwar Iraq, Shinseki's comments and their public rejection by the civilian leadership were often cited by those who felt the Bush administration deployed too few troops to Iraq. On November 15, 2006, in testimony before Congress, CENTCOM Commander General John Abizaid said that Shinseki had been correct that more troops were needed. President Barack Obama and guests at signing of bill to grant Congressional Gold Medal to 100th Infantry Battalion and 442nd Regimental Combat Team in recognition of their World War II service. Shinseki is at the far right. On December 7, 2008, then-President-elect Barack Obama announced at a press conference in Chicago that he would nominate Shinseki to become the Secretary of Veterans Affairs. Shinseki was unanimously confirmed by the United States Senate on January 20, 2009, and sworn in the next day. In May 2014, Shinseki was embroiled in a scandal involving the Veterans Health Administration, which is a component of the United States Department of Veterans Affairs. Questions involving substandard timely care and false records covering up related timelines had come to light, involving treatment of veterans in a number of veterans hospitals. On May 30, 2014, President Obama announced that he had accepted Shinseki's resignation as Secretary. Shinseki said he could not explain the lack of integrity among some leaders in veterans healthcare facilities: "That breach of integrity is irresponsible, it is indefensible, and unacceptable to me." He said he could not defend what happened because it was indefensible, but he could take responsibility for it and he would. Shinseki's resignation was the first time since 2000 that there had not been an Asian American in the Cabinet of the United States. In an interview with retired General Peter W. Chiarelli, journalist Robert Siegel described the situation as "a case of a very, very good man who's run up against some pretty terrible problems in his job," to which Chiarelli responded, "I don't look up to any man more than I look up to Eric Shinseki." Shinseki is married to his high school sweetheart, Patricia; they are the parents of two children, Lori and Ken. He also has seven grandchildren. ^ "Award citations, Eric Ken Shinseki". Hall of Valor. Military Times. Retrieved April 20, 2015. ^ "Biography, General Eric K. Shinseki". Campaign for the National Museum of the United States Army. Army Historical Foundation. Retrieved April 20, 2015. ^ Jaffe, Greg; O'Keefe, Ed (May 30, 2014). "Obama accepts resignation of VA Secretary Shinseki". Washington Post. Retrieved August 19, 2014. ^ a b Eric Shinseki (May 12, 2009). "Remarks by Secretary Eric K. Shinseki, 2009 Secretary's Awards for Excellence in Nursing". U.S. Department of Veterans Affairs. ^ "Overseas Contigency Operations Profiles". Asia Pacific Americans in the United States Army. United States Army. Retrieved August 19, 2014. ^ a b c Sauer, Bobbie Kyle (December 18, 2008). "10 Things You Didn't Know About Gen. Eric Shinseki". U.S. News & World Report. Retrieved April 9, 2015. ^ "Eric K. Shinseki". Encyclopædia Britannica. Retrieved May 30, 2014. ^ Fahrig, Jody T. (June 23, 1999). "Army welcomes Shinseki as new chief". Army News Service. Archived from the original on March 12, 2008. Retrieved May 27, 2006. ^ Shinseki, Eric K (June 10, 2003). "End of Tour Memorandum" (PDF). The Washington Post Company. Retrieved December 7, 2008. ^ Thom Shanker (January 14, 2009). "A Second Act for General Shinseki". The New York Times. Retrieved February 6, 2012. ^ Gregg K. Kakesako (March 31, 2004). "An Inspiration for a Generation". Honolulu Star Bulletin. Retrieved February 6, 2012. ^ Thom Shanker (October 29, 2002). "Army Takes on Critics of an Armored Vehicle". The New York Times. Retrieved March 20, 2011. ^ "Objective Force is Needed for Relevancy". AUSA News. Association of the United States Army. April 1, 2001. Archived from the original on May 9, 2014. Retrieved March 20, 2011. ^ "Beret battle: Army approves color change". Amarillo Globe=News. March 16, 2001. Retrieved March 20, 2011. ^ Shanker, Thom "New Strategy Vindicates Ex-Army Chief Shinseki", New York Times, January 12, 2007. ^ CNN Political Unit. CNN Political Unit debate fact check. CNN.com. October 9, 2004. ^ a b Ricks, Thomas E.; Ann Scott Tyson (November 16, 2006). "Abizaid Says Withdrawal Would Mean More Unrest". The Washington Post. p. A22. Retrieved December 13, 2006. General [Eric] Shinseki was right that a greater international force contribution, U.S. force contribution and Iraqi force contribution should have been available immediately after major combat operations. ^ Rucker, Philip; Thomas E. Ricks (December 6, 2008). "Shinseki Slated to Head VA, Obama Confirms". Washington Post. Retrieved December 7, 2008. ^ "Shinseki biography". Forbes. Retrieved December 7, 2008. ^ "The Purpose Prize: Shinseki". Retrieved December 7, 2008. ^ "Obama: No one 'more qualified' than Shinseki to head VA". CNN. December 7, 2008. Retrieved December 7, 2008. ^ Abrams, Jim (January 20, 2009). "Senate confirms 6 cabinet secretaries". Real Clear Politics. Retrieved January 10, 2013. ^ "VA's top health official resigns amid scandal over delays in vets' care | Military Times". militarytimes.com. May 15, 2014. Retrieved May 19, 2014. ^ "US president accepts with 'regret' Veterans Affairs chief's resignation". Chicago Chronicle. Retrieved May 31, 2014. ^ Mak, Tim (June 1, 2014). "There Are No Asian-Americans In The Cabinet For The First Time Since 2000". The Daily Beast. Retrieved August 19, 2014. ^ Siegel, Robert (May 30, 2014). "Retired Army Gen. On Shinseki: 'I Don't Look Up To Any Man More'". NPR. Retrieved May 31, 2014. ^ Shane III, Leo (June 19, 2013). "Shinseki's style: Determined, quiet". Stars and Stripes. Retrieved April 9, 2015. ^ "Eric K. Shinseki". Office of Public and Intergovernmental Affairs. United States Department of Veterans Affairs. Archived from the original on September 15, 2014. Retrieved January 29, 2013. ^ "Overseas Contingency Operations". Asian Pacific Americans in the United States Army. United States Army. Archived from the original on January 26, 2014. Retrieved January 28, 2013. "Chief of Staff of the Army Official Portrait". Army Leadership. United States ARmy. June 24, 2001. Archived from the original on April 29, 2003. Retrieved January 29, 2013. ^ a b "Eric Ken Shinseki". Hall of Valor. Gannett. Retrieved March 13, 2015. Tran, Can (December 7, 2008). "Obama Picks Army Gen. Shinseki To Head VA". Digital Journal. Retrieved September 14, 2014. ^ a b c "President-Elect Barack Obama Announces General Eric Shinseki as Secretary of Veterans Affairs". The American Presidency Project. UCSB. December 7, 2008. Retrieved August 30, 2014. "Transcript of the Chief of Staff of the Army's Remarks to Soldiers Radio and Television (after the attacks of September 11th)". Army News Service. September 14, 2001. Archived from the original on December 10, 2008. Retrieved January 26, 2013. Burlas, Joe (June 10, 2003). "Commentary: Shinseki leaves legacy of irreversible momentum". Army News Service. Archived from the original on December 10, 2008. Retrieved January 26, 2013. Boyer, Peter J.. A Different War – Is the Army becoming irrelevant? The New Yorker, July 1, 2002. "Eric Shinseki collected news and commentary". The New York Times.